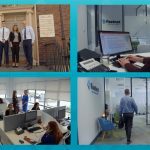 Videozoom produced a series of 23 training webinars for Uniphar Group plc which is the largest integrated healthcare supply and services provider in Ireland. Uniphar has two divisions, Manufacturer Services and Retail Services. The Manufacturer Services has built a total outsourced solution for healthcare manufacturers across Ireland and the UK. The Retail Services business supports community pharmacists to run a profitable business and give the best possible service to their patients and customers. The provision of training webinars to community pharmacists is a key part of the organisations outreach and support programme. Uniphar is a vital part of the healthcare infrastructure. Working behind the scenes at each step in the value chain, they help manufacturers and pharmacists to get medicines and services to patients safely, quickly and cost effectively. The Uniphar training webinars were recorded live with multiple cameras at Cork Airport Hotel in March and April and they provide a fantastic resource for community pharmacists to run a profitable business and give the best possible service to their patients and customers. Our client required a very fast turnaround with these videos so that they could be posted online and via social media while the training seminars continued throughout the country. We were happy to oblige! The training webinars are currently featured on the Uniphar website and are receiving hundreds of views from the community pharmacy industry throughout the country.